In the wake of Ramin Hosseini Panahi’s death sentence, seven political prisoners at Rajaee Shahr jail in Karaj wrote an open letter to the regime and the Iranian public. The letter, entitled “Hanging is a murder by the government in all circumstances”, urged international organizations and sympathetic members of the public to rally against the barbaric and inhumane application of capital punishment. Ramin Hosseini Panahi was sentenced to death in January on charges of “taking up arms against the state”. The 22-year-old Kurd’s trial lasted less than an hour, and he had visible evidence of torture on his body as he faced the charges in court. He was forbidden access to his family and his lawyer in the weeks leading up to the trial and received little information regarding the charges against him. His death sentence has been widely criticised by international human rights organizations, including Amnesty International, who have called for the imminent halt of the execution. The execution is due to take place on Thursday, May 7th. Hanging is increasingly seen as a barbaric form of punishment, so much so that over 100 countries have outlawed the execution method. However, the opposite has occurred in Iran. It has increasingly become the mullahs’ preferred form of punishment for political prisoners. According to Amnesty International, Iran executes more of its own citizens than any other country on earth. 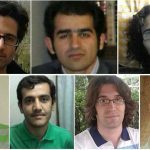 Saeed Masoori, Zaniyar Moradi, Saeed Shirzad, Arash Sadeghi, Payam Shakiba, Loghman Moradi, and Majid Asadi risked their lives by penning their open letter. However, they have succeeded in drawing more attention to the barbaric and tyrannical measures employed by the clerical regime in Iran. 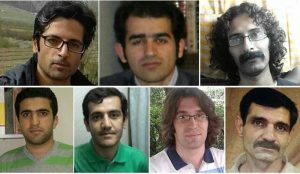 Whether their letter helps bring about a change in the penal system remains to be seen, but their bravery and determination in penning the message to the world will ensure that the regime is held accountable for its systematic abuse of the Iranian justice system.